In the middle ages, the Bible was read aloud as part of church services and during daily prayers, and it was privately for theological study and personal devotion. A variety of aids were developed for these different kinds of reading. For theological study, surrounding the text from the Bible with explanatory notes and / or words written between its lines to help the reader understand obscure or difficult vocabulary and grammar. This is called 'glossing'. This manuscript contains St Paul's Epistles with commentary glosses. It belonged to the Franciscan convent at Oxford. One of the new orders of preaching friars, the Franciscans were part of the scene at medieval universities. On this page, the letter to the Galicians has a prologue, which begins with a large decorated letter 'P'. The second large 'P' bears a picture (called a 'historiated initial') of St Paul placing his hands on a man's shoulder while his wife and child look on. The red notes in the upper margins are references to the early Christian authors--Jerome, Ambrose and Augustine--whose writings the commentary excerpts. 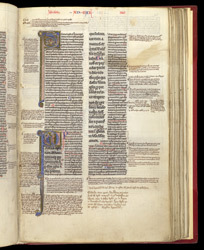 The biblical text is written in large letters on the left side of the columns, while the commentary, in smaller letters, is at the side, top and bottom. All around the margins are further schoolmasters' notes.